As we all know, early spring fishing can be tough at any lake but especially at Table Rock. As a clear water Ozark highland impoundment, it hosts all three native Missouri species in good numbers. This adds a new variable for anglers, do they concentrate on the larger Black Bass, the more aggressive Spotted Bass or the more predictable Smallmouth. Practice proved tough for most of the anglers, with some large fish being caught but numbers hard to find. Anglers explored all parts of the lake from the deep, clear water bite near the dam to the dirtier water up the Kings and Long Creek. In the clearer water temperatures ranged from 44-48 degrees with temps as high as 54 degrees in the more stained water up the rivers. Alabama rigs, Wriggle Warts and Swim Baits proved to be the most reliable baits, but some jerk bait fish were caught in the clear water with spinner baits and jigs working in the stained water. Typical of early spring tournaments, the weather proved to be a variable for all the anglers. Our cold spring has delayed the normal spring migration but the warm up the week before our event had the fish moving daily. Saturday started cool but clear skies and bright sun quickly warmed the participants. The shifting winds foretold the incoming front and unfortunately the heavy rain hit us just as weigh-in began at about 3:00 o’clock. Sunday’s weather also was a challenge with shifting winds and warmer temperatures. Since most fish were positioned on primary and secondary points, the wind turned the bite on and off as the wind shifted hourly. The boater side was won by one of our perineal front-runners in Robert Hime. 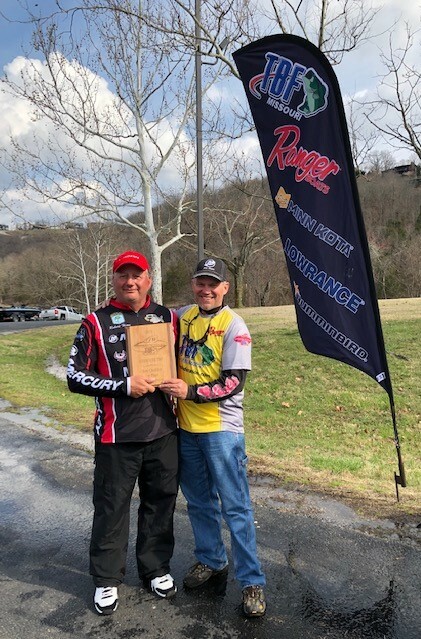 He led the event from wire to wire with a Saturday bag of 17.42 pounds which he followed up with 15.32 pounds on Sunday for a total of 32.74! Like many anglers Robert struggled finding numbers in practice with only 3 keepers on Friday, but like all good anglers he made the right adjustment on Saturday and hit some new spots. His first two keepers came on Commemorative Creations wart style bait and followed it up with a swimbait fish. This still left him with only 3 keepers at noon, so he made his second adjustment and it proved to be key. Over the next 2 hours on his new location Robert boated 11 more keepers on swimbait! Obviously, Robert started Sunday on his hot location but also saw some schooling fish in the back of a nearby cut and picked up additional fish to allow him to cull up to the winning weight. The small swimbait he used was small Table Rock shad color on a ¼ oz jighead. Second place was won by an old friend of Missouri TBF, Cole Finley. It was nice to have Cole fishing with us again and it was no surprise that he found two limits on Table Rock lake even in tough conditions. His Saturday bag was 12.53 which he followed up with 16.56 on Sunday for a total of 29.09. Cole worked hard each day with an A-rig to entice bites from deep trees. His local knowledge allowed him to focus on the most productive individual trees and used his electronics to quickly determine if active fish were present and willing to bite. By working his A-rig erratically, he triggered fish that were following his bait to bite throughout the day in varied conditions. Rounding out our qualifying field was a new TBF member, Justin Layton. He followed up his first day bag of 12.05 with 13.92 on Sunday for a total of 25.97. Justin spent practice time in the dirtier water throwing a crankbait but was not satisfied with the bite and made an adjustment for tournament day. Electing to fish the cleaner water on the main lake he concentrated on deep trees with an A-rig. Location was key for him, concentrating on bluff walls and/or channel swing banks. His bite was deep, so he had to count his rig down 15 feet and patiently retrieve the rig at a very slow speed. Our strong boater field proved that good anglers can always find fish, even in changing conditions. We had 3 other boaters find a limit of keepers every day with Scott Hill, Brad Tyer and Chris Embry each sacking 10 fish. Tom Kaufmann had a strong showing on Saturday, culling through multiple keepers to sack 17.28 pounds which included the big bass of the tournament of 7.14 pounds. Each of these anglers used the A-rig as their primary bait, including the big bass for Tom. 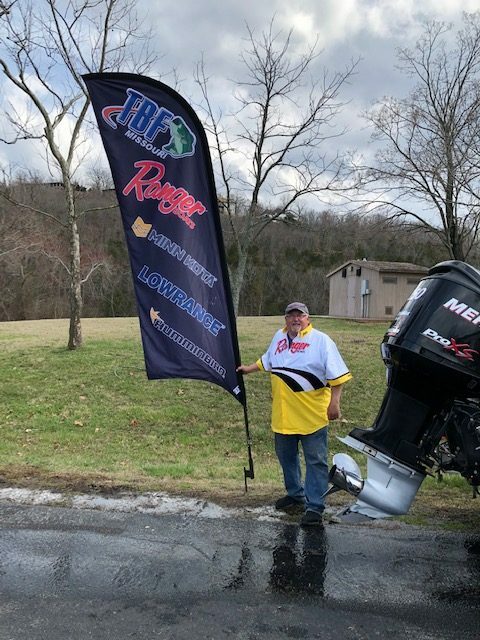 The A-rig contributed the most fish for this event but since the fish were deep, several of the submerged trees now have new ornaments hanging from their limbs all over Table Rock Lake. 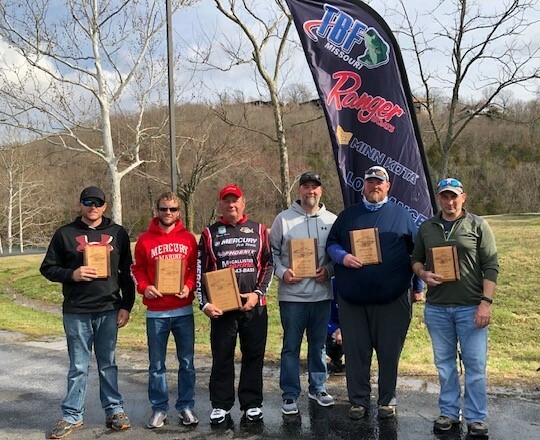 The Missouri TBF has one of the strongest co-angler group of any circuit in the country and they did not disappoint at Table Rock. Fishing behind a quality group of boaters can be tough, especially when the bite is on an A-rig but these co-anglers figured it out. Leading the field with a late charge on Sunday was Jason Morisaki. Not being deterred by a tough day on Saturday, Jason brought 11.41 pounds to the scales on Sunday that included 5.99 big bass! He found his fish by concentrating on steeper, wind blown secondary points with an A-rig and a jerk bait. Finishing second was one of our consistently competitive co-anglers, Gary Martin. He caught a mixed bag of Black, Spotted and Smallmouth fish each day with a total bag of 11.20 pounds. He focused on the 10-25 foot depths around Kimberling/Shell Knob area. He used a jerk bait for the shallower fish and an A-rig to probe the deeper depths. Sean McBee returned to the Missouri TBF to add to our already strong co-angler field and took the last qualifying slot with 9.79 pounds. Like most anglers Sean tried several baits in practice but focused almost exclusively on the A-rig during the event. He found the smaller bladed rig with 3-4 inch baits produced the most bites. Color was also key in the clearer water so he used fat swimbaits in the darker colors without additional flash/glitter. Unfortunately, his fish were also in the trees so he donated several A-rigs over the two days to the lake. Table Rock is our first Qualifying event which leaves all boaters and co-anglers with 3 more opportunities to qualify for the National Semi-Final. The next chance to qualify is at our second annual Buddy Bass event at Lake of the Ozarks on May 19th at Pa-Ha-Tsi (see website for Entry form). At this event the winning team qualifies for the National Semi-Final as long as both members agree to participate at the event. The next traditional Qualifier tournament will be at Truman Lake be June 8-9th. Finally, each club in good standing with a minimum of 6 dues paid members on April 1st will be eligible to send their club champion boater and co-angler to the event (all dues must be paid to Missouri TBF by 4/1/19). We look forward to seeing everyone at the upcoming events and want to thank you for your support of the TBF.